This month, we celebrated the annual Hay Festival, a festival of art and literature here in Hay On Wye. The Hay Festival takes place every May/June, welcoming visitors to Hay On Wye for ten days of art and literature celebration. The Festival invites writers, filmmakers, comedians, politicians and musicians to entertain and inspire the thousands of visitors who will stop by. I love Hay Festival. It’s not that I am widely read, appreciate all literature or have highbrow music taste but it the highlight of the year for the team at Holt Farm Holiday Cottages. As a local business in Hay On Wye, we’re delighted to welcome the Hay Festival. For 27 years, it has drawn people into the beautiful Brecon Beacons area and is a fantastic event for showcasing the beauty of our region. For us as an accommodation provider in Hay On Wye, we have a huge demand for our luxury holiday cottages over the entirety of the Festival period. People come from all corners of the UK to absorb the wonderful atmosphere, and our guests are always really delighted with the cottages here at Holt Farm. Quite often, our guests extend their time here beyond the Hay Festival to make a real holiday of it. Our guests tell us that they love the buzz of the Hay Festival, parents and children alike, and they love being able to then get back to Holt Farm away from the crowds and step into the peaceful countryside and the comfort of their holiday home for the week. Of course, as the Hay Festival has grown in popularity, so too has the number of guests the Festival welcomes. That means Hay On Wye is, understandably, a tad busier during this period. We find that the increased footfall to the area brings with it a really great community feel. Everyone is happy to welcome the Festival’s guests and you’ll find streets lined with happy people and special offers for shoppers and tourists to enjoy. 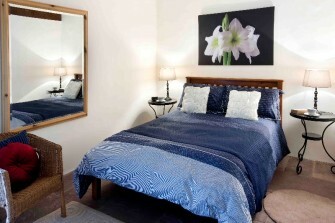 For those looking for a bit of quiet and solace during the Festival, our cottages provide just that. You can also spend time out and about in the local surrounding areas, discovering more of the gorgeous Herefordshire landscape. The majority of Hay Festival guests tend to stay around Hay On Wye. Here, you’ll find an abundance of activities to keep you busy beyond the festival. 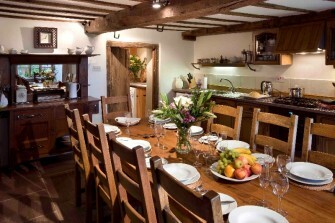 Hay On Wye is also a real treat for food lovers, with lots of gorgeous restaurants filled with local, home cooked food. This is a real must do for anyone visiting the Herefordshire area. The Brecon Beacons is a mountain range in South Wales and is the main focus of the National Park. The area is also home to some lovely villages and market towns. A great activity for anyone who likes walking, sight seeing and shopping. Take a look at http://www.breconbeacons.org/ for more information. The area around the Hay Festival is home to a range of stunning castles and churches. It’s also worth visiting the ‘Three Castles’ in the borderlands of Monmouthshire. These three castles form a triangle, surrounded by a 20 mile circular trail linking the ‘Trilateral’ of Skenfrith, Grosmont and White Castles. Blanavon is a town and World Heritage Site in South East Wales. It lies at the source of the river Afon Lwyd just north on Pontypool and within the boundaries of the historic Monmouthshire county. Here, you’ll find quaint shops and beautiful scenery. You may also remember Blaenavon for being the site of a Time Team dig in 2001, where Channel 4’s archaeology programme sought to find the ‘Lost Viaduct’. As well as being a great spot for walkers, the Brecon Beacons offer some fantastic cycling trails for all abilities. Take a look at http://www.cyclebreconbeacons.com/ for more information and bike hire companies. For the more active guests of Hay Festival, Hereford offers a range of adventure activities to try. From abseiling to gorge walking to rock climbing to canoeing, there’s a wide range of activities to suit every taste. Mountain Mayhem is one local company offering a range of activities, and you’ll find plenty more activity companies in the area. You can find more days out in Herefordshire and things to do in Hereford on our website. The Hay Festival grows in popularity every year and it can be difficult to find anywhere in the immediate vicinity to stay. More astute guests will look slightly beyond Hay On Wye to the neighbouring villages, where demand is still high but you’re more likely to find somewhere away from the masses. 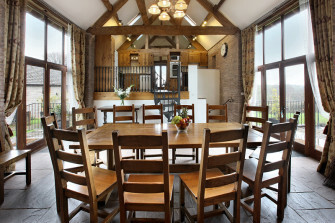 Holt Farm is a collection of four luxury holiday cottages in Michaelchurch Escley, just 20 minutes from Hay On Wye. 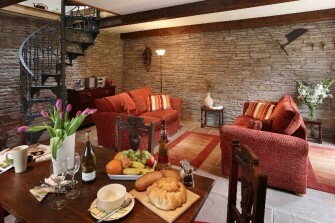 We offer accommodation for as few as 1 guest up to as many as 22 guests if you book all four cottages. If you’d like to find out more about our luxury holiday cottages, or to ask about availability for the Hay Festival, visit / or call us on 01981 510 238.